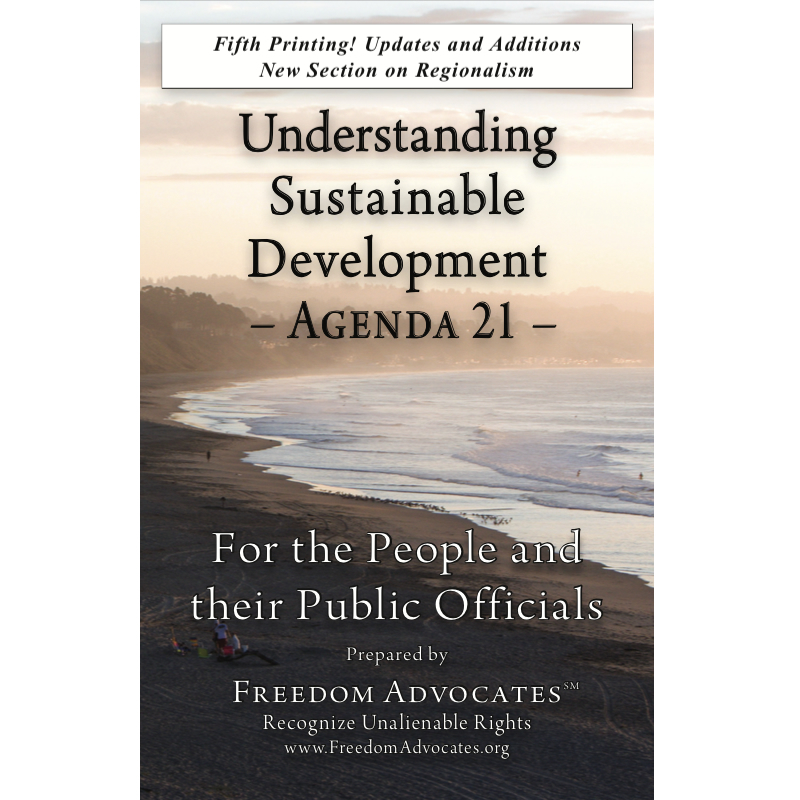 Home » Articles » Sustainable Development » Agenda 21 – What is it? How Did it Get Here? “Agenda 21 and the United Nations” – Prepared for the Mises Institute Austrian Scholars Conference, March 16-18, 2006, Auburn, Alabama. Agenda 21 is a 300-page, 40-chapter, “soft-law” policy document adopted by the delegates to the United Nations Conference on Environment and Development in Rio de Janeiro in 1992. The document is not legally binding; it is a set of policy recommendations designed to reorganize global society around the principles of environmental protection, social equity, and what is called “sustainable” economic development. At the heart of the concept of sustainable development, is the assumption that government must manage society to ensure that human activity conforms to these principles. The idea that government is inherently empowered to manage the affairs of society is diametrically opposed to the idea that the just power of government is derived from the consent of the governed. As these conflicting principles collide in the arena of public policy, the people who are governed are losing the ability to limit the power of government. Consequently, government power over people is expanding. Nowhere is this transformation more dramatic than in the policies governing private property rights and the use of land and its resources. Historically, the right to own and use private property in America has been considered to be a sacred right.This right is being usurped by government, which now dictates to private property owners how their land may – and may not – be used. This paradigm shift from sacred private property rights to government-managed land use, is a perfect example of how sustainable development is transforming America into a government-managed society. (b) All countries should establish as a matter of urgency a national policy on human settlements, embodying the distribution of population…over the national territory. (a) Public ownership or effective control of land in the public interest is the single most important means of…achieving a more equitable distribution of the benefits of development whilst assuring that environmental impacts are considered. The recommendations contained in this report are remarkably similar to the conclusions reached in three publications financed by the Rockefeller Brothers Fund, compiled and edited by William K Reilly. The first, The Use of Land: A Citizen’s Policy Guide to Urban Growth, was published in 1972. The second document, entitled The Unfinished Agenda, was published in 1977. Many of these recommendations were included in the “Land Use Policy and Planning Assistance Act” advanced by Morris Udall during the 1970s. Congress rejected the legislation, which forced the proponents to develop another strategy. The third publication of the Rockefeller Brothers Fund was entitled Blueprint for the Environment, which was 1500 pages containing 730 specific recommendations delivered to President-elect, George Bush on November 30, 1988. William K. Reilly was responsible for the development of each of these publications. He was also one of the U.S. delegates to the 1976 U.N. Conference on Human Settlements who signed the document on behalf of the United States.This same William K. Reilly, left his job as head of the World Wildlife Fund, to become the Administrator of the Environmental Protection Agency, appointed by George H.W. Bush. possible by 1994, a review of capacity – and capability-building requirements for devising national sustainable development strategies, including those for generating and implementing its own Agenda 21 action programme; On June 29, 1993, President Bill Clinton complied with this recommendation by appointing Vice President Al Gore to conduct a National Performance Review, and by issuing Executive Order Number 12852, which created the President’s Council on Sustainable Development. Its 25 members included most Cabinet Secretaries, representatives from The Nature Conservancy, the Sierra Club and other non-government organizations, and a few representatives from industry. The function of the President’s Council on Sustainable Development was to find ways to implement the recommendations of Agenda 21 administratively. Al Gore’s National Performance Review resulted in overhauling the Departments of Interior and Agriculture to implement what he called the “Ecosystem Management Policy.” This policy embraced many of the recommendations found in Chapters 10 through 18 of Agenda 21, all of which deal with management of land and resources. At the 11th meeting of the President’s Council on Sustainable Development, Ron Brown, then Secretary of the Department of Commerce, reported that his department could implement more than 60 percent of the recommendations of Agenda 21 through the rule making process, without additional legislation. Similar reports came from the Department of Housing and Urban Development. This publication provides model legislation for state legislatures which, when adopted, writes into state law many of the policy recommendations set forth in Agenda 21. The Ecosystem Management Policy, coordinated with existing legislation such as the Endangered Species Act and the Clean Water Act, gave the federal government the power to regulate land use in rural America. The model legislation provided in the American Planning Association’s publication, gave state governments the power to regulate land use at the state, county, and municipal levels. The federal government encouraged states to adopt this legislation by offering incentive grants to states and to local governments. Consequently, the recommendations prescribed in Agenda 21 are being systematically implemented across the nation. This process is transforming America into the managed society envisioned in the 1976 U.N. Habitat document. This vision has been described in much greater detail in subsequent documents published by both the U.N., and the federal government. This report describes precisely what the model legislation produced by the American Planning Association is designed to accomplish. Most states have now enacted some form of comprehensive planning legislation, which requires each county to develop a land use plan that conforms to the recommendations that originated in the international community, and were filtered through the President’s Council on Sustainable Development, and written into law by state legislatures. Nearly every community in the nation is involved in some form of “visioning” process designed to construct public policies consistent with the recommendations set forth in Agenda 21. This process virtually ignores the idea of sacred private property rights. This process assumes that government has the right, and usurps the power, to “manage” not only land and resource use, but nearly every facet of human activity. Throughout the entire process, the role and influence of the U.N. is minimized, or denied. Especially at the local and state level, even the most active proponents of “sustainable development” are either unaware, or deliberately deny, that the process is related to the United Nations at all. Nevertheless, American society is being transformed. Private property rights have been all but extinguished, and government is now managing land and resource use – exactly as the United Nations said it should – in the 1976 U.N. Habitat Conference document, and in the 1992 Agenda 21.
. A more thorough analysis of the policy recommendations from this conference report was published in eco•logic, January/February, 1997 edition, page 8, and is available on the Internet at http://sovereignty.net/p/land/unproprts.htm.
. Global Biodiversity Assessment, Section 13, Page 993.
. Reed F. Noss, “The Wildlands Project,” Wild Earth, Special Issue, 1992, pp.13- 15. (Wild Earth is published by the Cenozoic Society, P.O. Box 492, Canton, NY 13617). Henry Lamb is the Executive Vice President of The Environmental Conservation Organization, Inc. Mr. Lamb assembled the first meeting in Chicago in 1988, from which the Environmental Conservation Organization grew. He is also Chairman of Sovereignty International, Inc., and writes a weekly newspaper column for WorldNetDaily and other publications. Visit the eco-logic Powerhouse at www.freedom.org. Henry Lamb has a comprehensive archive totaling more than 2,000 pages and accumulated since 1994, located at Sovereignty International’s Library.